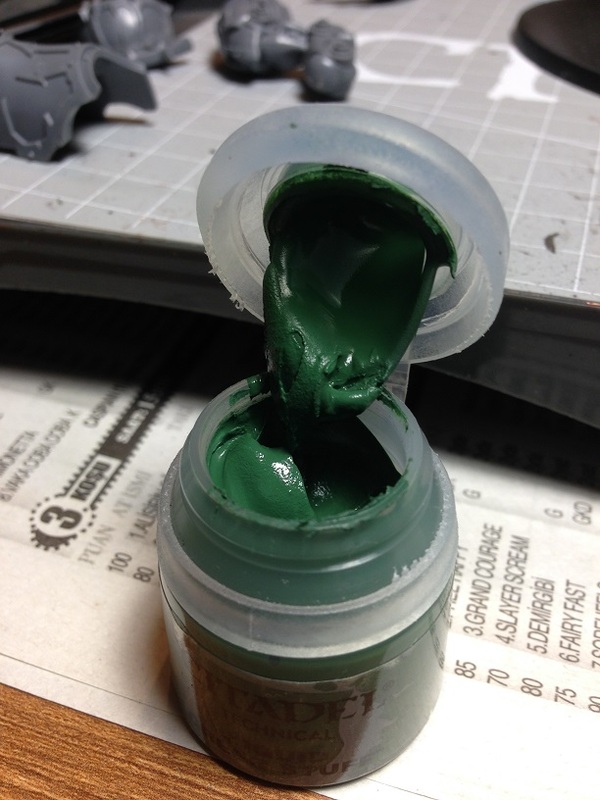 Liquid Green Stuff (LGS) is, as I see from this week’s sessions, a very fiddly product. Its consistency resembles that of cream food products during application which aids malleability by a great deal, especially if you have to apply it to uneven lines like those of Chaos models. GW states that the product is designed to be applied to smaller defects and bubbles for resin and plastic models. Goopy and holds its consistency surprisingly well. When applied to a surface the product sticks to it and you can then spread it around to wherever you’d like to apply it with a tool. Think of it as a layer paint: one coating on its own is not really enough for larger gaps where you might fare better with the epoxy putty or the packaged Green Stuff. If the applied amount is too much you have about 1 minute to remove it from the surface before it starts to dry out. And that is why I think the product is fiddly: it dries out very fast in clumps both on the tool and the spread surface. So plan ahead about how much you will apply on a model or better yet, reapply the stuff in layers like I did. The sides of the chimneys have larger join lines than other parts so I started there. One coat was enough to fill out a line. The excess LGS can be wiped away on a piece of paper (don’t use napkins as they will stick to your tool instead) or with a finger. Once dry use a file or a mold line remover to eliminate excess. When in doubt, start with the lines you would like fixed that will not be seen on assembly and work from there. Here I applied way too much of the stuff in the wrong places. but with a wet tool it is easy to realign and apply. The arm join lines are the more difficult ones, since they’re recessed among details. I recommend applying in layers here to avoid clogging up other details. In recessed surfaces where you have some room to move around use a rounded tool to even out the LGS. So you might be asking now how much is correct for application. While I have to note that your mileage may vary, I have used VERY little of the stuff to fill out the relatively small gaps. Without a proper tool it is very difficult to move around as LGS has granules in it that stick to new surfaces like crazy. Fortunately I had acquired rubber brushes from my favorite tool store, Güven Sanat (thanks to Chris from Buypainted for the idea by the way) to do the job. You can get a set of these at Güven Sanat for 5 USD. The set has 6 different heads, but I foresee using this round brush and the flat brush the most. This is the maximum I used for the model. Anything more for small gaps and you’re wasting LGS. Always wet your tool. Otherwise you’ll get clumps of LGS midway like I did. LGS dries very fast. Work quickly and in the right doses to avoid destroying details on models. Use a wet tool to avoid clumps settling on the brush. This also helps with retarding the drying process. Apply LGS in layers. In larger quantities you will lack the finesse for smaller areas and will change the model. Similar to the Citadel basing paints range when you spread the LGS it becomes very thin. This is both great and terrible: it’s easy to remove from surfaces but spread it too much and you can’t control it back to shape. Avoid napkins (or paper towel type products) like the plague. Not only will it not remove the LGS from your tool it will stick tiny little hairs on it. Then you’ll have to wash the brush for good. Since the tools are from rubber they collect dust very fast due to the nature of the material. Keep them either in your clean brush case (I need to get one) or back in its package. To remove excess use a tool you have confidence using, such as a mold line remover or a smooth file. Avoid using sharper objects for they will either scar the putty, the model, you or all the above! I think I’ll need to try out the brushes with the regular GS to see if they work better there. For now, the LGS works just fine and I’m happy with the results. Next in line will be preparing the sub assemblies on painting sticks and priming the pieces with the spray, then proceed to the base coats. The learning steps in this kit will also be weathering, but I have not yet decided on how to do it. I’m open to suggestions both on this and the kind of base I’ll use for the model. Great advice. I generally have been applying with a tool and wiping off the excess with my fingers, getting it absolutely everywhere. I’ll try wetting it this time. Always full of great advice Roemer! If all else fails the finger intervention works well. The problem is with highly detailed minis: you absolutely cannot use this on a resin piece I reckon. Larger surfaced models like Eldar or SM should work OK. Thanks for the comment (and commendations)!